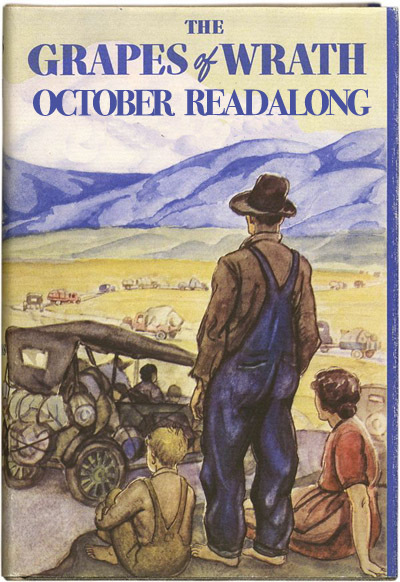 Devouring Texts: The Grapes of Wrath Readalong! Subsisting on Books, Films and TV. And occasionally Cake. The Grapes of Wrath Readalong! So, I've been going on about this for ages and people have been going 'I want to read The Grapes of Wrath with you, Laura!' and I'm like 'GREAT!' and then ignore the fact that I might actually have to do something useful where people can sign up and things and have an awesome picture thing to put on their blogs! Or... A kind of crappy picture thing that took THE LONGEST time to make and so no one's allowed to be mean about it, ok? The picture's not important, it's all about the book! This is really just a sign up post, but if anyone wants to share anything in the comments then, yeah, go forth with that! But otherwise, I'll post a weekly reading itinerary thing in the last week of September a la readalong QUEEN, Alice, and we'll be good to go! This'll be my... ooh, 5th or 6th time reading The Grapes of Wrath, but I'm POSITIVE it'll be the funnest! Sooooo sign up! Aw, that's a shame- I hope you liked it though, that's the important thing! We all knew I was doing this. 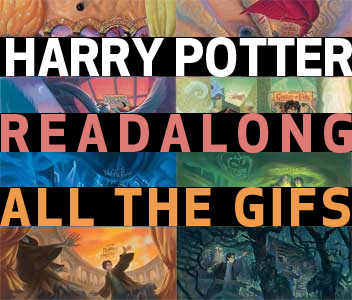 Because OUR READALONGS ARE THE BEST READALONGS. THEY ARE! :) Also, cause STEINBECK LOVE! I have been peer pressuring so many people into joining in on this. Because seriously, I'm excited for this even though I do not have happy Grapes memories. I'm hoping to make new ones. Peer pressure is the way forward! And I've seen your imploring links and I APPROVE of them heartily. You can keep doing that if you like ;). NEW HAPPY MEMORIES! My feeling is, you'll like the experience even if you still don't like the book. But I'll try and convince you that you do. That's what babies are there for, man! Hopefully you'll get through it though :) *whispers to your womb* stay in there baby til mum's done reading Steinbeck! Does Steinbeck have a big forehead or anything? Any sort of physical feature we can latch onto? Steiiiinbeeeeeck!! ... I am excited for this. I find Steinbeck preeeetty handsome actually, so... No. No humour in that. Apart from teasing me for fancying him/his WORDS. I am getting ridiculously excited for this, despite having pretty lackluster memories from reading it in high school. HOWEVER, I am looking forward to rereading the copy I have from back then, so that I can mock my teenage marginalia. Now that I have officially signed up, I will be transitioning into GIF-hunting mode. HUZZAH. LOOK FOR SAD GIFS, for you shall need them. For reals. Yay for readalongs! I'm soooo excited haha. I did it, I did it! It was actually really easy :s hehehe. I'm much TOO excited for this, seriouslyyy! Laura, this will be my FIRST STEINBECK. Should I read something else first, or can I just start a Sad Gifs subfolder like Rayna? Crossed fingers for the latter... It's already the 9th of September (WTF)! ARGH JUST TRIED TO REPLY TO THOS AND THEN SOMETHING BAD HAPPENED! Anyway. The gist is, you could read Of Mice and Men if you like to get a sort of Steinbeck's writing style taster, but it's really nothing like Grapes so totally not necessary. Just go forth and start your sad gifs folder. It will be needed! I've been wanting to read this for ages! Count me in. Thanks for hosting a read-along. Those people are clearly very silly and you must not communicate with them anymore! And also, calm down Tigger. Love, Eeyore. This is one of my all-time favorite books. I'm currently reading it for the second time. I have to finish it in a week for one of my doctoral seminars, otherwise I absolutely would have joined you all in this read-along! This is one of the titles on my Classics Club List. Steinbeck hasn't been my favorite in the past, but I thought a read-along with someone so enthusiastic about the book might help me see the book in its best light. Thanks for hosting this read-along! You're welcome, glad to have you with us! I'm guilty of never having read this book but like your flirty friend Jillian above I have lousy follow thru so I probably shouldn't join up. Besides I'm busy reading Cloud Atlas before the film comes out. I have to say, though, I really like your cheeky monkey (I know that dates me but so does my picture)style so I'll be back. Is it too late to join? I'm reading WAYTOOMANY books at the moment but since this is the last book on my Back to the Classics Challenge list, I feel like I should... you know... read it. And reading with other people is more fun than reading alone. Plus it will make me finish it, hurrah! I particularly ask about it being too late to join because the Mr. Linky does not appear for me above, which is confusing to a non-technically-minded person like meself. Awesome! Because I didn't have enough reading commitments for October already, ha! I love Steinbeck. I love The Grapes of Wrath. I wish you all well on this reading experience & I'm envious of anyone who gets to experience this for the first time! There is A WHOLE LOT going on in this book (I recently posted some thoughts about it over at An Armchair by the Sea & of course my review is up on my blog, too) - so if anyone is reading it and wondering if there's more to it than just its being a sad, dry, slow story about a sad, dry, slow family... please don't give up! Find me! Top 5 TV: Special Buffy Edition! The Little Stranger: A Thing. Sunday Sundries: Summer Is Here!